I finally pruned the wisteria hard enough last year -- sheets of bloom and fragrance, haunting fragrance. Shelley Powers of Burningbird has a series of posts on the (travelling?) Chihuly installation at the Missouri Botanical Gardens Glass in the Garden, Lonely Impulse, and Last of the Chihuly Photos. Thanks, Shelley, for bringing the photos. My sister Suz, the lavender farmer, (who employs the hard-to-employ) is giving a lecture on lavender cultivation. 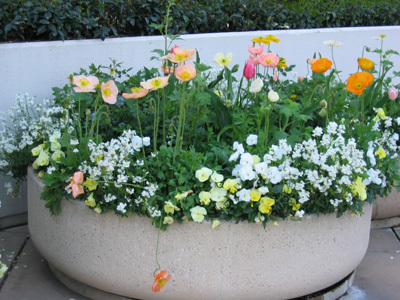 PACIFICA GARDEN CLUB meets on the second Wednesday of the month from 7 9 p.m. at the American Legion Hall, 555 Buel Ave. off Rockaway Beach Avenue. 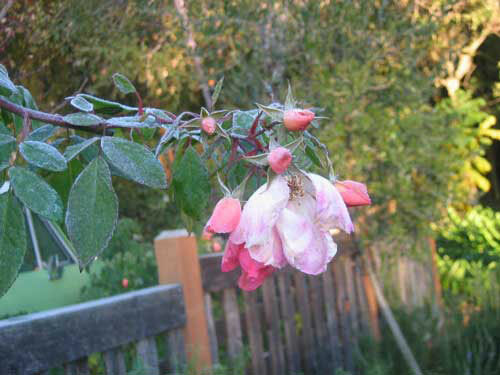 The speaker on Nov. 9 is Susan Ditz of Rancho Alegre in Pescadero. She will share her expertise in the growing and cultivation of lavender. Products made at the farm will be for sale. Call Joy at 738-8661 for more information. The public is welcome to attend. Well, this is December 5 before the sun hits. I don't know what rose it is, it belongs to a neighbor. The roses sometime never go dormant around here. boing boing reminded me that when Topher and I were designing the garden at Pony Tracks, we really wanted to do some of these extreme topiary.. The Circus Trees are another example of arbor modification, and were the original inspiration. But Dan Ladd's installation, Five Tree Arches, is kind of what I had in mind. A room with a view is easy to come by for patients at Stanford Hospital. Many rooms overlook colorful gardens, lavender-scented walks, and in spring, some of the 43,000 bulbs blossoming on the grounds. Katsy also designed the Stanford Shopping Center displays. 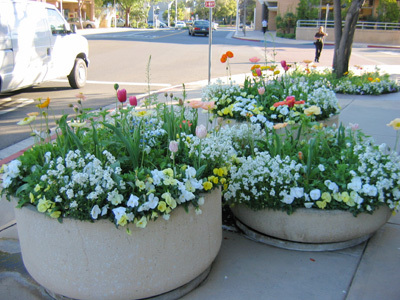 The hospital garden has large beds; the displays at the shopping center are more in pots, to break up the huge expanses of hardscape. This grouping is by the south entry to Neiman Marcus. One of the things that make it pleasing is that there is repetition and alteration. Some of the bowls have underplantings of forget-me-nots; some are heavier on the Iceland Popppies (which I believe are the Champagne mix) some are heavier on the tulips. Our very hot March probably messed with the timing of the blooms. The white flowers are I believe candytuft (I should have made better notes) and pansies. The other thing to note is that these are pretty large scale pots--a good three to four feet across, not your average backyard items. 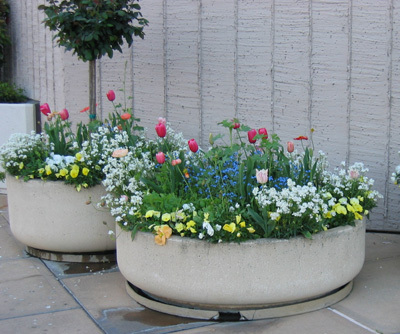 I like the foam pots that are popular now (sorry, can't find a foto link). One of the hallmarks of Katsy's style is very dense planting, which works great in settings like this because the plant material is removed and swapped out up to four times a year. I thought they were what were formerly called montbrias (scroll down in the comments). Then she asked me if I had a clue about what these flowers might be. I don't. They look like they are growing in a pot, and have long, floppy, strappy leaves. I am guessing some kind of orchid, and I am very weak on orchids. 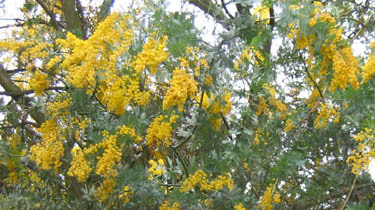 Early Spring (February) in California is colored a hot, intense yellow, at least in Northern California suburbs. The plants that provide the color are all non-natives. Some are horrible invaders, like scotch broom. Others are invaders, but less horrible. As I was driving around, I moved backwards 300 years in my mind's eye. The wild oat grass (which is most of what provides the green) is an exotic, not a native. I believe most of the native California grasses were bunchgrasses, but I rely upon the greater wisdom of the California Native Plant Society. Now, in late fall, the hills start to green up as the wild oats sprout. The timing depends upon the rains. By Christmas, usually, open meadows are bright green. The mustard starts blooming, too, and then the acacias. 300 years ago, before Europeans brought the annual grasses, spring would have been heralded by the ceanothus, first, and then the decidious oaks, which have a subtle reddish-pinkish color as the new leaves unfurl. Salvia clevelandii has the most incredible fragrance. The flowers are sort of ball-shaped and not very interesting, but the foliage exudes a delightful fragrance year-round. It is relatively hardy--I go by the Sunset New Western Garden Book , which says it is hardy to about 20 degrees F.
forget-me-nots (Myosotis sylvatica or M. alpestris). It is fabulous while growing, but then sets seed. The seeds are tiny and hairy; any animal coming close to the plant is immediately covered with seeds, which are difficult to remove.